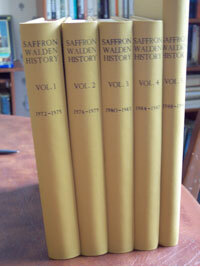 The illustration shows the five bound volumes of Saffron Walden History published from May 1972 to 1991 by the Saffron Walden Historical Society. It was the brainchild of John Gerard O’Leary, FSA, its first editor. Saffron Walden History had a more limited local circulation but was very successful, usually with two issues each year. John O’Leary’s editorials were particularly lively and pertinent. After about 20 issues, Neville Price took over as editor, with Miss Musto organising duplicating and Richard Jemmett assisting with production. Following Neville’s retirement, no new editor could be found and the autumn issue of 1991 was the last for the Old Series journal for ten years until it was revived under the New Series title Saffron Walden Historical Journal in 2001. But the back issues of its predecessor, which can be read in bound volumes at Saffron Walden Town Library, remain today a superb source for local historians. An index of titles for all 40 issues of Saffron Walden History published between 1972 and 1991, and issues 1-25 of the Saffron Walden Historical Journal published from 2001 to 2013, has been made by a volunteer, Jessica Hudson, at Saffron Walden Town Library. We thank Jessica for her work, and the Trustees of the Town Library for permission to reproduce it on this website. Further updates to the index will be added at intervals. The Index is in library format, providing Author, Title, Pagination and Subject under up to four headings. Pages 1-30 cover the Old Series Journal from 1972-1991. Pages 31-56 cover articles up to issue number 25 of the New Series Journal from 2001 to Spring 2013). Further index entries will be added in due course. Articles in the Old Series journals can only be read in archive copies at Saffron Walden Town Library, but selected articles from out-of-print issues of the New Series, re-titled Saffron Walden Historical Journal, can be found on this website. These articles appear by kind permission of the authors and editor, and remain copyright of the author and the Journal. Please note that in many cases, images have been removed from the online articles. A limited number of back issues are available for sale on request. PLEASE NOTE: Copies may be made for research purposes only, but the catalogue is the intellectual property of Saffron Walden Town Library, and permission must be sought to reprint all or part in any other publication or website.